This weekend was special in our home. In our faith, when children turn 8-years-old they can choose to be baptized. So on Saturday, the Princess was baptized. It was lovely. And afterwards, we had our family and close friends over to our house for refreshments. The decorations turned out so cute, I just had to share with you. 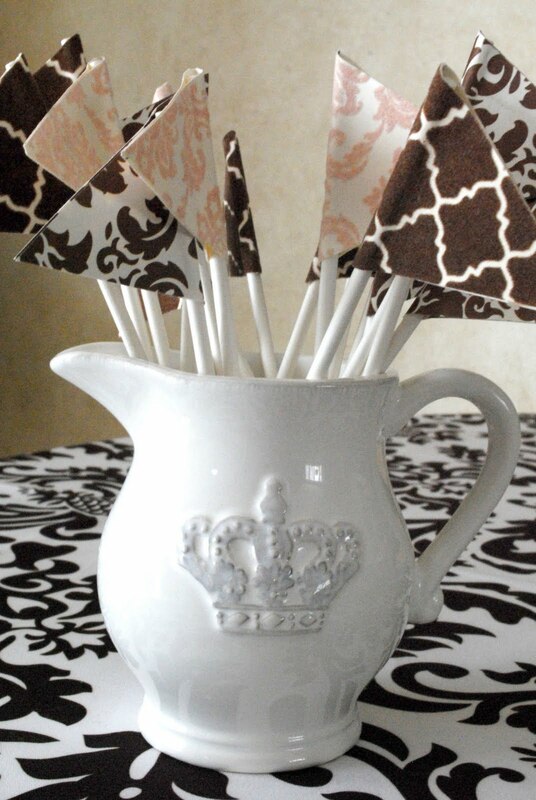 I chose to use a pennant theme for the table which I first covered in a pretty brown and white damask table cloth. I made several small pennant flags (tutorial to come) and placed them in a little creamer which I, in turn, placed on top of a small cake plate and used as a centerpiece. 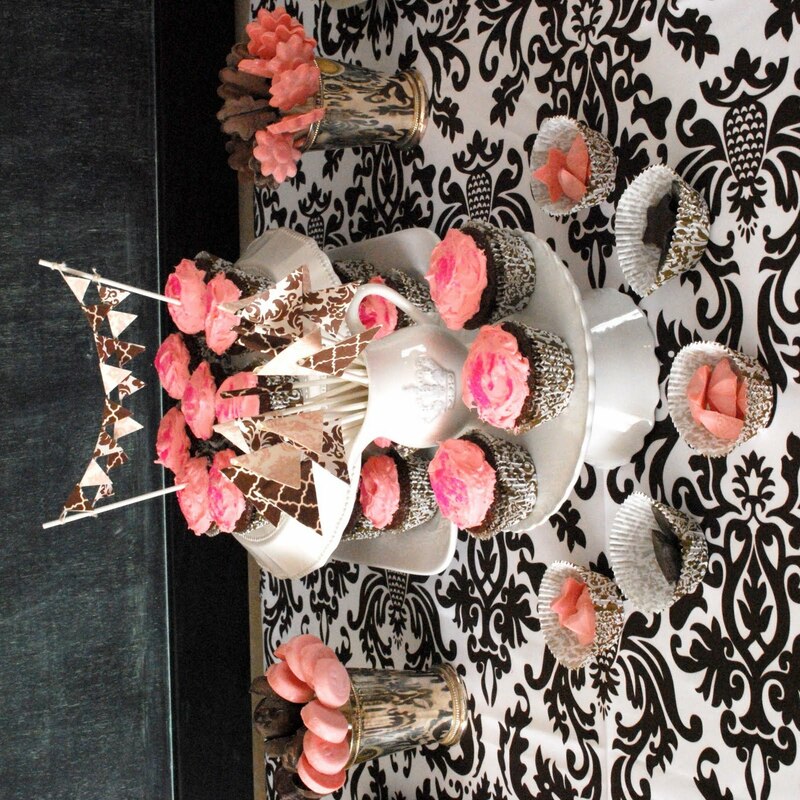 I finished off the table with some homemade lollipops in pink and brown, and a pennant banner made from the same papers as the centerpiece and cake bunting. As well as a pretty, glittered congratulations banner from Martha Stewart's craft line. Family and friends brought the remaining goodies (pot-luck style) and with everything going on I didn't actually get a photo of the table all full of food...but you get the idea. All in all, a lovely goodie table...for a lovely day....for a lovely daughter...whom I adore! If you have not already, Please check out my blog for the giveaway I have going. Awww, you made it so special!! Congratulations to your little princess! Ours is turning 8 next month and she is super anxious about her baptism! She turns really really shy in front of large groups... so we let her plan the whole thing! Speakers, songs, treats etc. Still trying to talk her through the "I can't go under water with out my googles!" issue - so we'll see! We're having a little after party too...love your ideas! 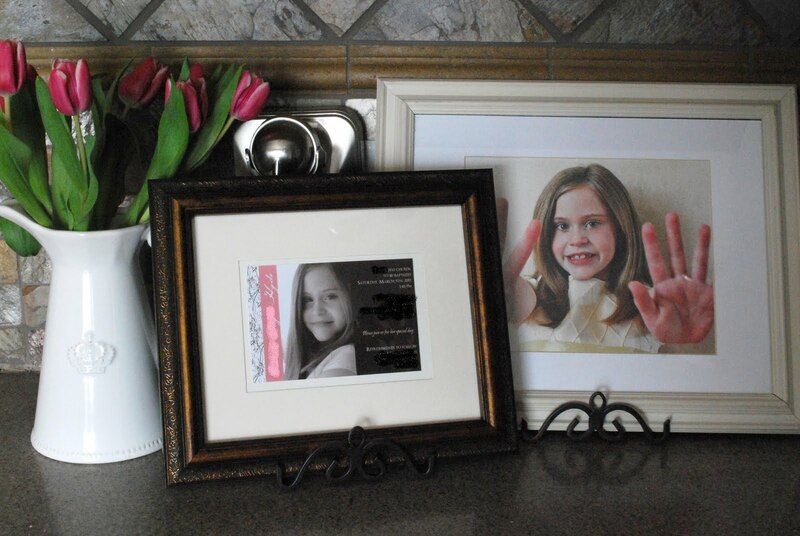 The decorations and styling for this celebration for your GORGEOUS girl are beautiful. Thanks for sharing. Oh so adorable, Wendy! Can we see her baptism announcement/invite up close? It looks beautiful and I've got a thing for them ;). So the oldest here is getting baptized soon too. But I was just going to be a lazy A and send us all over to Golden Corral after! You put me to shame!! Wendy, everything is just as cute as can be! What a beautiful setting for such a special day. Thanks for the tutorial! We've got a baptism coming up and appreciate you sharing your fun ideas!! PS - where did you find your cute tablecloth? How FUN is that! I love the look! Thanks for sharing! What a great party! I was just wondering where you got the tablecloth and cupcake liners? 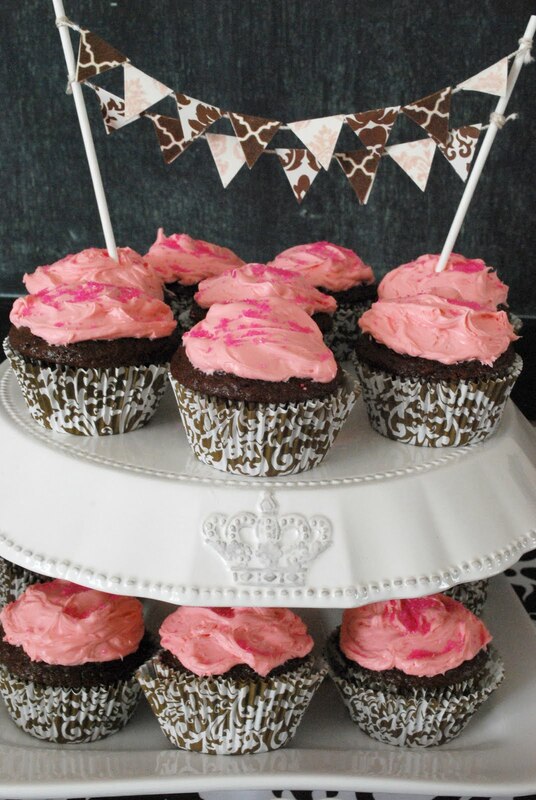 I have a sweet 16 party for my oldest to plan this year and her room is done in damask so this would be cute for her! Thanks! 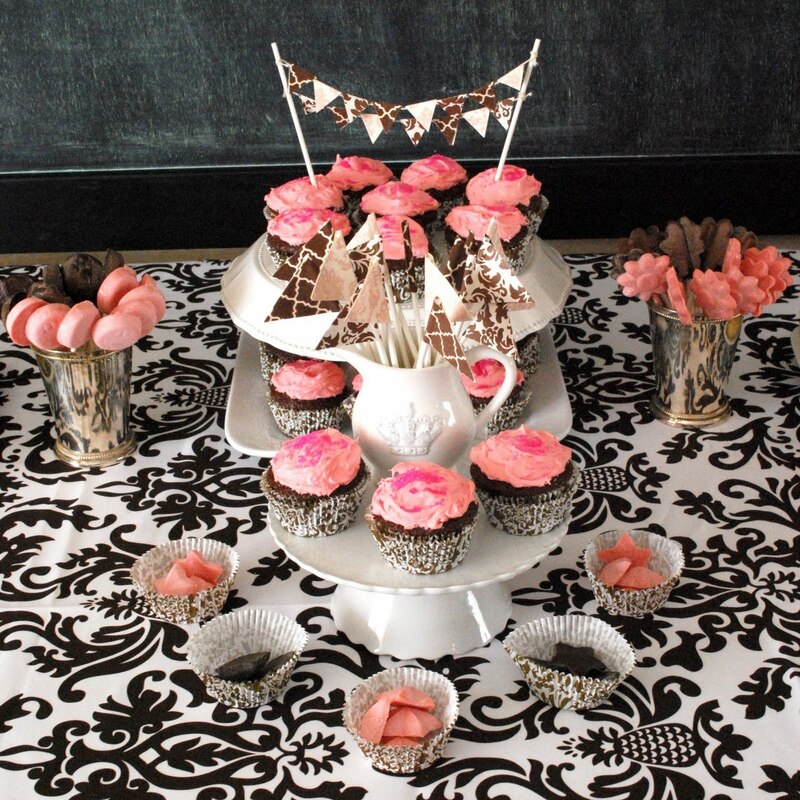 The tablecloth came from Tai Pan...the cupcake cups came from Michael's Craft.